After many defeats at the hand of Iron Man and other heroes - including the Inhuman Black Bolt - The Mandarin was able to rebuild his power base. Convinced that Iron Man remained his worthiest adversary, The Mandarin has once again turned his attention to defeating his longtime foe. The question remains though, will he have more success than he has in years past? The Mandarin is to Iron Man what the Green Goblin is to Spider-Man or the Joker is to Batman: he's the arch-villain, even though others may have been fought more often over the years. This is the way he looked in the '80s, with the big green and gold robe. Unfortunately, the robe is hard plastic, so it completely blocks all movement. At least the details are sculpted in. 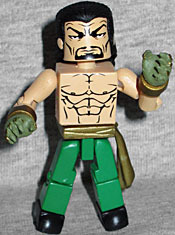 He gets new hands, too - Minimates usually have one less finger, but since the Mandarin is defined by his ten rings, he gets the full complement. Recognizing that a toy that can't move is a pretty pointless thing to sell, Art Asylum designed their Minimate knowing that most buyers would, at some point, take off the robe. Underneath he's shirtless, but fully detailed. He's got golden bands around his wrists, and a sash at his waist. His black hair still hangs down his back, though since it doesn't rest against the body at all, it tends to pull the head back, causing him to look slightly upward - a perfectly cromulent thing for a guy who fights someone in flying armor. The set also includes a second pair of hands, done in green to represent the story where he got his hands blown off in an explosion and they somehow regrew as dragon hands. Comicbooks are weird. The Dreadnought is a combat robot created by HYDRA for use in their nefarious schemes. It is constructed from a titanium/steel alloy giving it super strength and durability. Many are capable of attacks featuring flame, electricity and other lethal enhancements. Can't say I've ever heard of the Dreadnought robots, so thank goodness for these bios on the back of the box, eh? The robot is metallic blue with black paint for the details, which seem accurate to the comics. He gets a new head, glove pieces with spiked knuckles, and shin dealies that look like they belong to Hercules but don't. We also get extra weapon hands: Iron Man's hammer, and the sonic hammer the Sentinels inherited from Cyborg. 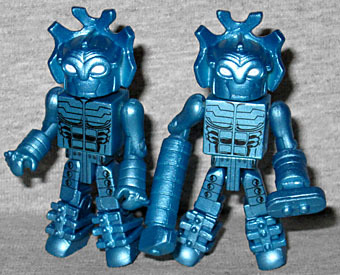 Good thing, too, since Mandarin gets a variant and that means you'll be armybuilding the big blue robot. Raised by his Aunt after his parent's [sic] death, he used his brilliance and wealth to rise to prominence as an adult. Years later, he discovered the wreckage of an alien starship and the ten rings that had powered the vehicle. Wielding the power of the rings, The Mandarin's ultimate goal is nothing short of ruling the entire Chinese empire! 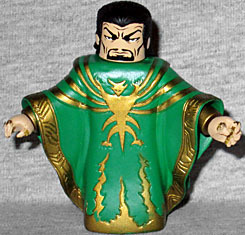 The variant Mandarin is wearing his original 1960s costume, which was much more traditionally supervillainous. It's a green smock with a purple belt, boots, wristbands and cape. 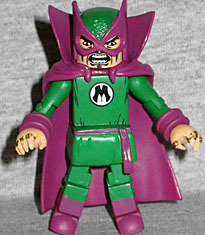 There's a big M in a circle on his chest, and he wears a totally goofy pointed purple mask and green cowl. His face is much wilder than the modern version's staid expression, and he gets the same new hands. 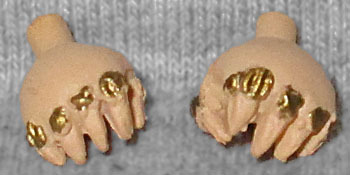 Amazingly, despite the small size, Art Asylum actually went to the trouble of sculpting each ring with a different shape. You can't really make out the details unless you're really looking, and the rings are just painted gold, but the effort is there. Good show, team! The Dreadnought robot isn't a very exciting offering, but what else could they have really done? Mandarin isn't one to use a lot of identifiable minions, and Iron Man doesn't have many generic enemies (that haven't already been turned into Minimates, at least).